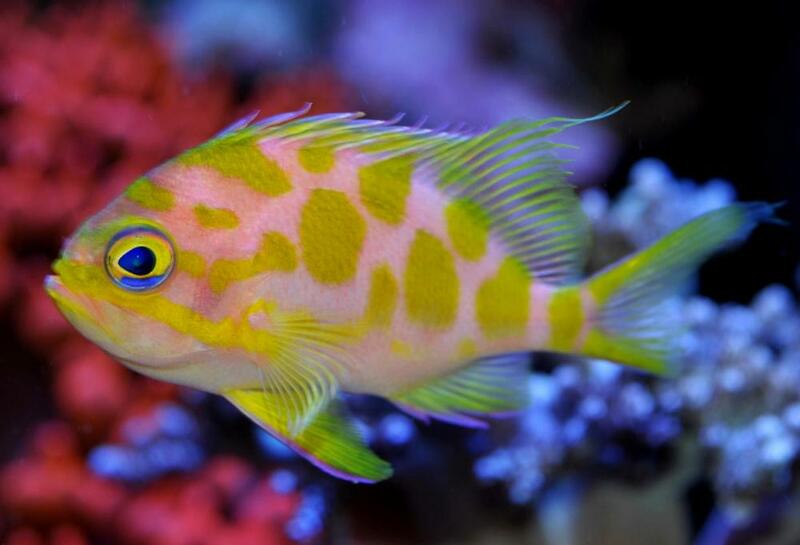 Too much light in your aquarium makes your fish lose its color? Home / Fish / Too much light in your aquarium makes your fish lose its color? Hello guys, Richard here again. As you may have noticed, I am very active on social media sites and I try to absorb all the information that I can from various people that I follow and respect. I also visit forums from time to time to discover new trends and find out what other hobbyists are trying these days, and I often come across some interesting piece of information or a question that really grabs my interest. This happened to me yesterday; allow me to share it with you. 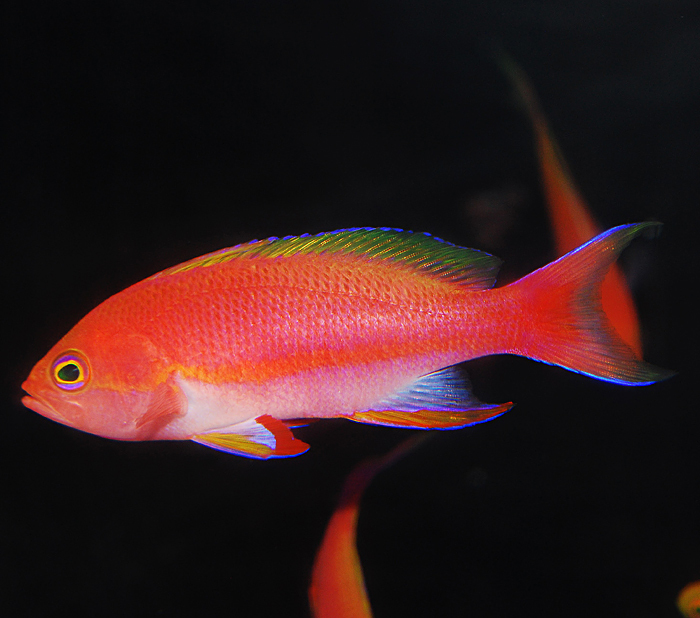 In a Korean reef club forum, I was informed that the high intensity of lights in our home aquarium will affect our fish’s (specifically anthias) colors. This is something that I have never heard of before and I was immediately fascinated. I admit that I doubted the validity of this claim, as I have always thought that it was nutrition that affected the colors of the fish and that it had to be some very intense lighting to have a “tanning” effect on fish. Unable to solve this with my google ninja skills, I went on and asked some of the industry professionals to check out the validity of this claim. First I went to two of the top food manufacturers in the industry, Larry DuPont of LRS Foods and Chad Clayton of Reef Nutrition, both of whom utilize pigment enhancers in their food. 2. Effect of Varying Levels of Astaxanthin on the Orange Color Intensity in Amphiprion ocellaris. (Virginia Tech 2015-16) It was found that 400pm astaxanthin was the optimal concentration for color in A. ocellaris, so we changed the TDO top-dressing formula to match the findings. The result has been significant pigmentation enhancement in clownfish (both egg coloration as well as color in broodstock and post-metamorphic individuals), and has also resulted in improved pigmentation in many other saltwater and freshwater fish. The red carotenoid is produced by the freshwater algae, Haematococcus pluvialis. 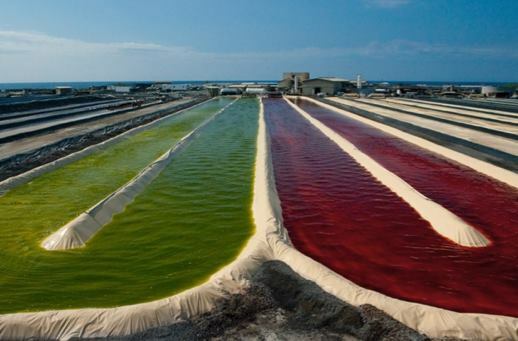 You should see the ponds at different facilities turn blood red when this species starts synthesizing astaxanthin. Then I went a different route and asked people with more science and in the field experience: Richard Ross, Julian Sprung, and Austin Lefevre. Richard Ross: Lighting on its own can influence the color of anything, so more light can make a fish look washed out. I would suspect that if the fish is really losing color it’s nutritional. 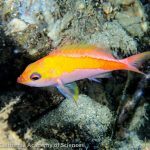 There are reports of male anthias losing color but brightening when females are introduced. There is the lingering idea that light makes them lose color but I don’t buy it. I don’t think I buy it with even deepwater anthias. 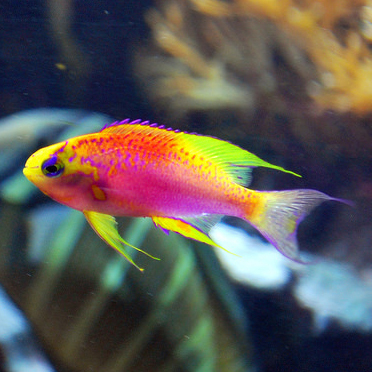 The ventralis (anthias) in my brightly lit reef tank hasn’t lost its color. But maybe. Especially if there are no dark hiding places – in which case stress seems to be more likely than light on its own. This feels post hoc ergo propter hoc to me. People looking for causation where there is only correlation. Julian might be hip to more research than I on this topic. 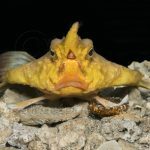 Julian Sprung: There is some evidence that lighting in aquariums (and sunlight too) has an influence on the color of fishes… often bright lights produce darkened areas. You can see it in clownfish and in pygmy angelfishes especially. Diet of course also influences coloration.Melanin can be stimulated by UV and there are other effects of light on coloration noted in published literature. 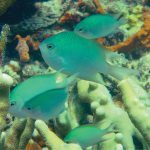 See for example: Effect of Light Levels on Growth, Survival and Skin Colour Enhancement Of Marine Angelfish, Apolemichthys xanthurus – ( Sathyabama University, India and Annamalai University, India. 2016.2017) Austin Lefreve: I’ve seen three or four Centropyge multicolor shift so much they could almost pass for a C. nahackyi. I currently have two Gonioplectrus hispanus in acclimation boxes, held in a large refugium section of a sump at the office. One of them escaped from its box and shifted color within a week, literally tanning under the refugium lights. I eventually caught it and put him/her back in the box. Hopefully, the colors will brighten up again. Also, check out Asian Arowana tanning articles. With all that said, the fishes I worked with first hand were in great shape with well-rounded diets. As Julian and Richard mentioned, I suspect most of the stories we hear are nutritionally based. There you go guys, from my inquiries, here are the things I found that can change a fish’s colors. 1. Lack of proper nutrition. 2. Lack of mate (just all males). 3. Stress of not having enough hiding spots. 4. Stress inducing tank mates. 5. Temperature. (For example, deep water fish are used to colder waters. In warmer water, it may acclimate and live but may not hold the same color that it did in the wild) 6. Lights. Yes. From Julian and Austin, we found UV will stimulate the melanin and can affect the colors. However, it is my opinion that fish will not stay on the top of the tank to “tan” like arowanas in freshwater. Us reef hobbyists have tons of rocks where fish can swim through, hide, rest, and perch on to the rock work that makes this a highly unlikely scenario (in my opinion) in your fish’s loss of vibrancy in color. 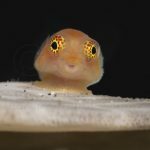 In case you have questions on what Rich Ross feeds his fish, from conversations we had, he has told me that he feeds his tank very heavily with ” … a mix of food. Mostly LRS, PE Calanus, and Hikari Mysis. 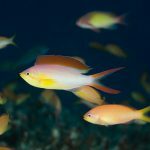 Some PE pellets and flake.” From the personal experience of keeping anthias for several years myself, I didn’t experience any loss of colors on barletts, lyretails, or borbonias anthias. I fed the tank very heavily with extremely nutritious and carotenoid-rich foods like LRS Reef Frenzy, LRS fish eggs, PE Mysis, Hikari bloodworms, Reef Nutrition’s arctic pods, ROE, gut loaded live baby brines, TDO, and Coral Frenzy pellets. Feed your fish well with well balanced nutritious meals, reduce their stress in their surroundings by trying to provide/mimic natural surroundings, provide good tank mates as well as actual mates for your fish, and I think you will do just fine. Happy reefing!